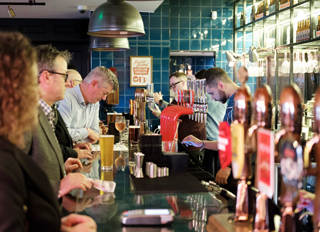 Previously The Tea Merchant, Canary Wharf’s favourite pub is now simply known as The Merchant - and it’s not just the name that’s changed. Following a brief closure for refurbishment, the pub has taken on a brand new look inspired by the craft movement - and it now becomes Fuller’s second ‘Craft House and Kitchen’ following the success of The Hydrant. The Merchant’s new bright, modern interior is perfect for casual after-work drinks, and indeed there’s now more choice than ever behind the bar. Craft beers are the focus of a superb new collection that takes in eight cask and 16 keg lines - with a range of unusual and exciting brews available from producers all over the world. Real ales and cocktails are among the offer too, arguably best enjoyed on the stunning outdoor terrace overlooking the waters of Canary Wharf’s North Dock. Food at The Merchant will be a social affair - with delicious fresh dishes on the main menu designed for mixing, matching and sharing with friends. There’s a breakfast menu available too, plus weekend brunches and the all-important Sunday roast. Dining can be enjoyed in the main bar area, or there’s a fabulous private dining room known as ‘The Container’ for more intimate occasions. Seating up to 16 guests (30 standing), The Container is a stylish mix of industrial design and timeless elegance - with glass-panelled walls offering a unique view over the docks. It’s perfect for parties and of course, based right at the heart of London’s financial centre, it’s an ideal meeting space too. After all, what better way to do business, than over fabulous food and drink?